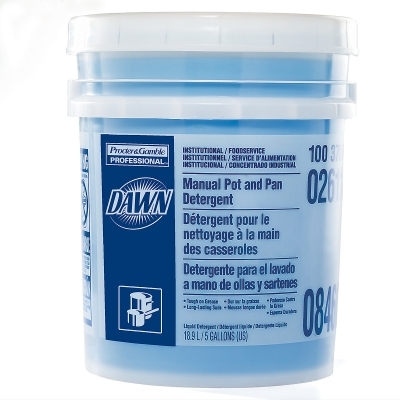 A concentrated, liquid manual pot and pan dish detergent. Specially formulated to remove greasy food soils from pots, pans and utensils. May be diluted to make a versatile, all-purpose cleaning solution. Use on coffeemakers, countertops, dining tables, tile walls and cooler doors. Size: 5 Gallons/Pail UPC: 10037000026119 Color: Dark Blue SKU: J00133 Tags: 02611	DAWN	MANUAL	POT	&	PAN	.